As we age a certain level of memory loss is expected. This happens because the connections between our brain cells get weaker. There is a big difference between simple forgetfulness and serious memory loss though. In the United States over 5 million people suffer from Alzheimer’s disease. The majority of these cases are 65-year olds or older, but at least 200,000 have what is referred to as “younger-onset” Alzheimer’s. Researchers say there are certain signs that can tell us if we are likely to get the disease. When we get older our memory starts to slip a little; we might forget the names of people we don’t see very often, we could have difficulty recalling parts of an event, and we may not put items away properly. Simple forgetfulness can be frustrating; however, doctors will tell you it isn’t anything to be concerned about. If someone starts to forget the names of people they see on a frequent basis, can’t remember recent events, and puts things away in odd places, it might be reason for concern. This person could be displaying signs of Alzheimer’s disease. Memory loss or putting items in unusual places are just a couple of the warning signs. People who are developing the brain disease also have difficulty retracing their steps when they are searching for something or when they are trying to find their way home from a store for example. If you notice that someone’s vocabulary has changed, it could also be an indication of Alzheimer’s disease. Studies, including one conducted by researchers in the United Kingdom, reveal that in the early stages of the disease people forget the words they learned later in life. Scientists continue to research the causes of Alzheimer’s disease, but they do believe that genes play a role in the development of it. Those who focus on genetics have identified genes that can cause early onset of the disease and those that tend to cause late-onset. Early onset, referred to as “familial Alzheimer’s” only accounts for 5 per cent of Alzheimer’s cases. Recently, the New England Journal of Medicine reported that a team of researchers uncovered what they think are 5 signs of Alzheimer’s disease that can be detected up to 25 years before memory starts to really falter. The scientists studied 128 people from families who were at high risk of inheriting genes that lead to the disease. They used scans and lumbar testing to draw some of their results. Below are the signs they detected that indicated genetic link. 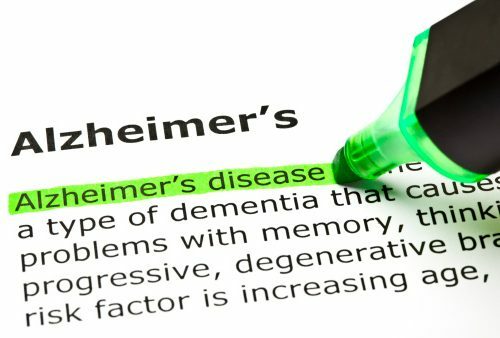 The research team believes as we learn more about Alzheimer’s disease, it will allow us to plan good preventative treatments. Today doctors are already promoting prevention. For instance studies show that those with high blood pressure, diabetes and high cholesterol have a higher risk of getting Alzheimer’s disease. Despite intensive laboratory work, there is no effective way to delay the forgetfulness and other symptoms associated with Alzheimer’s; however, many in the medical community believe that early treatment can slow down the progression of the disease. Until a cure is found, doctor’s orders are: keep your mind and body as active as you can.